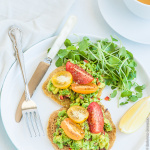 These gluten free and vegan chickpea and avocado pancakes are a healthy and satisfying way to start your day. Place the chickpea flour, salt and baking powder in a bowl and whisk to remove any large lumps. Add the water and whisk until smooth. Leave to rest for 30 minutes. Place a large non stick frying pan over a medium heat. Lightly coat the pan in oil and use a ladle to pour the batter into the pan. You can make the pancakes as big or as small as you like. Cook until bubbles form on the surface before flipping and cooking for a further minute. Place on a plate lined with paper towel to cool while cooking the rest of the batch. To make the topping scoop the flesh out of the avocado and place into a small bowl or ramekin. Add the capsicum, spring onion tops, lemon juice and salt and pepper and roughly mash. Check the seasoning and adjust as necessary. Place the avocado mixture on top of a couple of pancakes and top with cherry tomatoes, extra virgin olive oil and a little salt and pepper. Add the watercress on the side and you're good to go! Once the left over pancakes have cooled portion into zip lock bags or wrap in cling film and freeze. The pancake mixture should make enough pancakes for 1 person to enjoy throughout the week. It can easily be doubled to serve 2.